A revised and typeset edition of one of the most popular textbooks used for review of grammar and for writing Latin composition. The gold standard in Latin composition, used by thousands, for good reasons: Bradley's Arnold covers the elements of Latin grammar and syntax methodically, from the basic to the complex, and teaches students how to put them together to write accurately in Latin. Plenty of examples and exercises, passages for translation, English-to-Latin vocabulary, indices. Now updated with grammatical terminology more in use today. Completely retypeset, with clear, easy-on-the-eyes fonts and format. Bradley's Arnold is a comprehensive review of Latin grammar in the service of Latin prose composition. Bradley's Arnold Latin Prose Composition J. F. Mountford Bolchazy-Carducci Publishers 1000 Brown Street, Unit 101 Wauconda, IL 60084 0865165955 $29.00 www.bolchazy.com Now in a newly revised edition, Bradley's Arnold Latin Prose Composition is a classic and comprehensive review of Latin grammar and Latin prose composition with exercises to demonstrate key grammatical principles. The updated version's features include improved terminology and grammatical explanations, graduated lessons from simple to complex, supplemental continuous prose passages for self-testing, English-to-Latin vocabulary, a Latin index and a subject index, and much more. 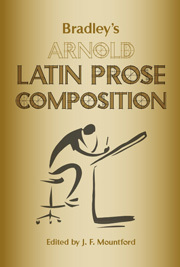 Though not a consumable workbook, Bradley's Arnold Latin Prose Composition is an ideal, user-friendly text for intermediate to advanced Latin students, whether studying the language in a college course or learning it on their own. Highly recommended.